* If Necessary. All times are Eastern. Tickets for Hershey's home games are on sale now! Tickets will be available at the Giant Center Box Office, by calling 717-534-3911, and online at Ticketmaster.com. Game Preview: Penguins at Bears, 7 p.m.
RADIO: WQIC-100.1 FM, Fox Sports 1460-AM, Zack Fisch, the Voice of the Bears and Freddy Cassivi on the call. 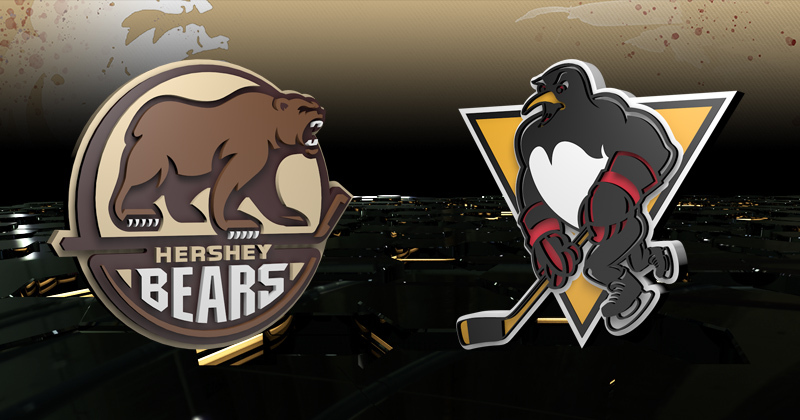 The Hershey Bears rematch against the Wilkes-Barre/Scranton Penguins after winning on the road over the Pens last Saturday. After a scoreless first period, Jayson Megna opened the scoring at 5:36 of the second period after following his own shot and scoring on the rebound. Wilkes-Barre answered at 12:28 after Thomas Di Pauli scored on a sub-goal line feed past Vitek Vanecek. Only 1:26 later, the Chocolate and White regained the lead on a 2-on-1 rush. A pass from Sergei Shumakov intended for Megna glanced off Pens defensman Kevin Czuczman and past John Muse to provide Hershey a 2-1 lead. Mike Sgarbossa added a key insurance tally at 16:28 of the third period which later stood as the game-winner in an eventual 3-2 victory. While the Bears were idle the next night, Wilkes-Barre/Scranton dropped a 4-2 decision to the Providence Bruins at Mohegan Sun Arena on Sunday. Adam Johnson and Jarrett Burton scored for the Baby Pens in the loss. Despite entering tonight’s game with a record of 9-10-0-1, the Bears have enjoyed success this season against the Atlantic Division. Hershey is 7-3-0-1 against divisional opponents entering tonight, good for a .681 point percentage. Last season, Hershey finished 19-30-3-4 against Atlantic Division opponents. The Wilkes-Barre/Scranton Penguins currently have lost five straight games with three coming in sudden-death overtime. The last time the Pens dropped five straight was during a losing streak from Feb. 13-23, 2016. Wilkes-Barre’s fifth lost occurred on Feb. 23 in a 4-1 loss to Hershey. Tonight, Wilkes-Barre will look to avoid their first six game losing streak since the 2014-15 season, when they went 0-5-0-1 from Jan. 3-18, 2015. Veteran forward Jayson Megna enters this week with goals in two straight games for the Chocolate and White. The center has scored three goals over the past four games, and has four markers in his past six games. Two of Megna’s goals have come versus the Pens. With five goals in 16 games for Hershey, Megna has already surpassed the four goals he scored with Utica last season in 25 games. Netminder Vitek Vanecek returned to the crease last Saturday after missing time with an upper body injury. The Czech Republic native picked up right where he left off, stopping 25 shots in the 3-2 win over Wilkes-Barre/Scranton. Vanecek holds a 4-3-0-1 record this season and ranks seventh in the AHL with a 2.36 goals against average. He has won three of his past four appearances. Game 2 Preview: Bears at Sound Tigers, 7 p.m.
Game 1 Preview: Bears at Sound Tigers, 7 p.m.
Game Preview: Wolf Pack at Bears, 5 p.m. Receive exclusive email with updates and offers. Trademarks appearing in bold, italics, or with an ®, SM or TM are owned or used by Hershey Entertainment & Resorts Company under license or with permission. All rights reserved.